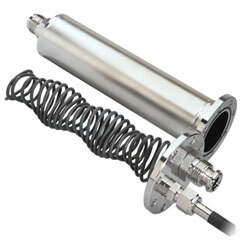 The STARFLOW™ circulation heater is engineered to heat a flowing gas stream to 1000°F (537°C). The circulation heater's 316L stainless steel chamber houses a small diameter sheathed element, which allows for quick response to both heat-up and cool down cycles. Watlow's starwound, coiled cable heater provides extremely efficient and reliable heating by maximizing the contact area of the gas or fluid with the element. Because the element is sheathed, the unit can operate in gas streams requiring a clean environment as well as atmospheres containing contaminants and moisture. This circulation heater provides superior performance compared to units with internally exposed or open element wires.